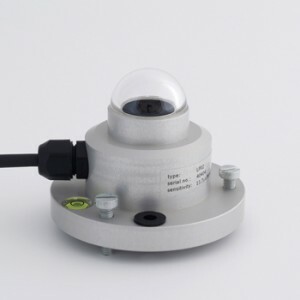 LP02 is a solar radiation sensor that can be applied for most common solar radiation observations. It complies with the latest ISO and WMO standards. The scientific name of this instrument is pyranometer. LP02 is a modern alternative for the so-called "star" or "black and white" pyranometers overcoming the problem of poor stability of the white reflective paint. LP02 serves to measure the solar radiation flux that is incident on a plane surface in W/m2 from a 180 degrees field of view (also called "global" solar radiation). Working completely passive, using a thermopile sensor, LP02 generates a small output voltage proportional to this flux. Contrary to photodiode-based- and "black and white" instruments LP02 has a spectrally flat response across the full solar spectrum. Using LP02 is easy. For readout one only needs an accurate voltmeter that works in the millivolt range. To calculate the radiation level the voltage must be divided by the sensitivity; a constant that is supplied with each individual instrument. LP02 can directly be connected to most commonly used datalogging systems. LP02 can be used for general meteorological observations, building physics, climate- and solar collector testing. A common application is for outdoor solar radiation measurements as part of a meteorological station. This application requires horizontal levelling; levelling feet (7) and a level (11) are included. The LP02 cable can easily be installed or replaced by the user.